A colourful microscopic view of a single piece of space-quality Inconel super alloy processed using two different 3-D printing techniques; this is a close-up of the boundary layer between them. The left side was produced using 'direct energy deposition' based on laser melting of metal powder feedstock, while the right side was made through 'powder bed fusion', involving the deposition then melting of metal powder. This micrograph of the resulting hybrid part is based on a technique called electron backscatter diffraction. 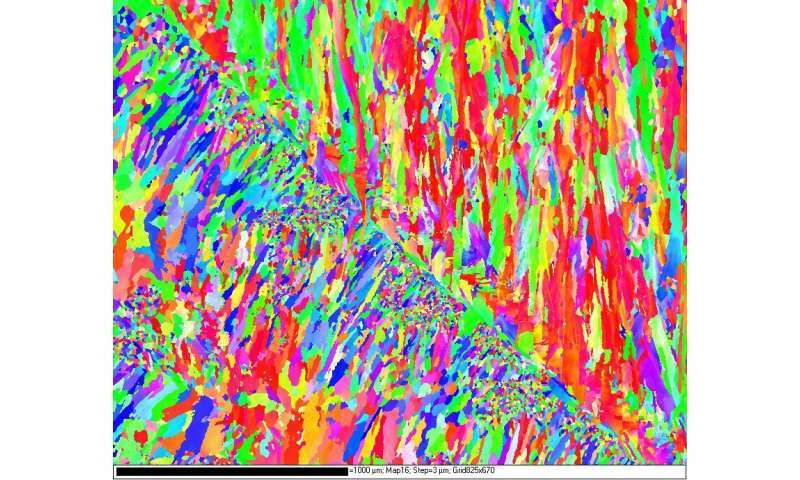 An electron beam was reflected off the crystalline metallic surfaces to reveal subtle details of their composition. The patches reveal different grains and the various colours depict the differing orientations of these grains. The part was produced as part of an ESA General Support Technology Programme project with the Balmar company and the Institute of Metals and Technology in Slovenia, an Associate Member State of ESA. ESA is working with research institutes and companies across Europe on its Advanced Manufacturing initiative, harnessing 3-D printing and other emerging manufacturing techniques to change the way space missions are made.